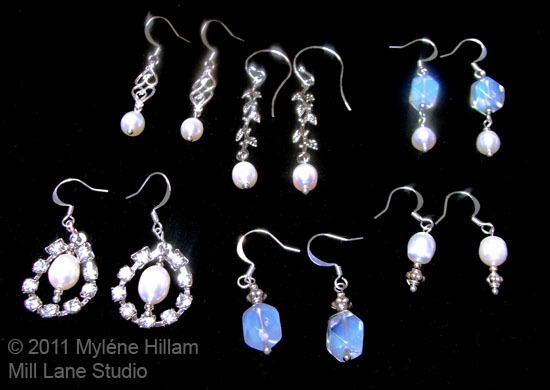 Mill Lane Studio: Moonlight and Pearls - A chance to win! I mentioned "earrings to match" in my last post and with so many beads left over from the re-stringing project I was able to get a little carried away creating a variety of variations.... don't you love it when you can indulge your creativity that way?!! So here's a selection of earrings to suit whatever your style is. But I promised Mum a simple pair of earrings to match her new double stranded necklace and together we decided short and simple with no dangles was more appropriate to a woman of her age. She picked the Moonshine earrings below. We both liked the pearls but because the moonshine beads were the focus in the necklace she thought that they would work better with the outfit she planned to wear this set with. And as for the rest? Well, I thought I'd have a bit of fun and describe what style I think these would suit best. Pearl Drops - For the woman who likes simple classics, you can't go past a pair of pearl earrings.... sophisticated and glamourous and perfect to wear with a twin set! 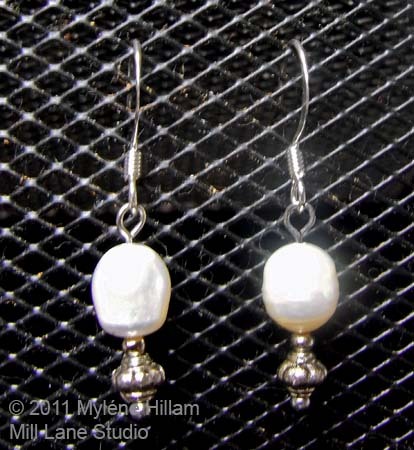 Another pair of earrings with simplicity in mind, Pearl Dangles. 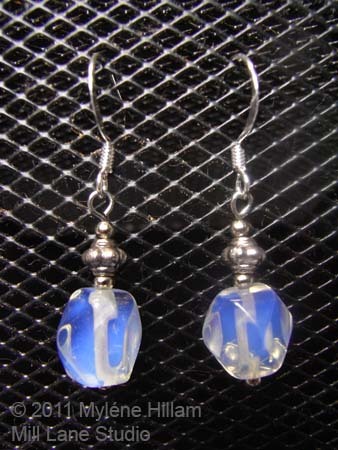 Perfect for the woman who likes just a little hint of movement in her earrings! 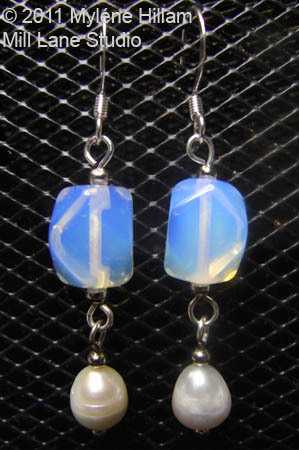 The moonlight beads make these a little less formal than the pearls above. Heart Drops features sterling silver heart-shaped connectors... très chic for the younger woman! 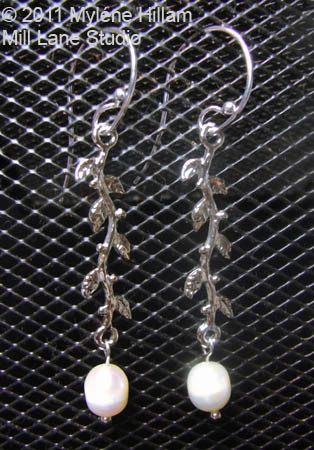 Elegant and romantic, Pearl Tendrils feature delicate leafy branches. These would look equally good with long locks or an upstyle. Love the earring wires on these! 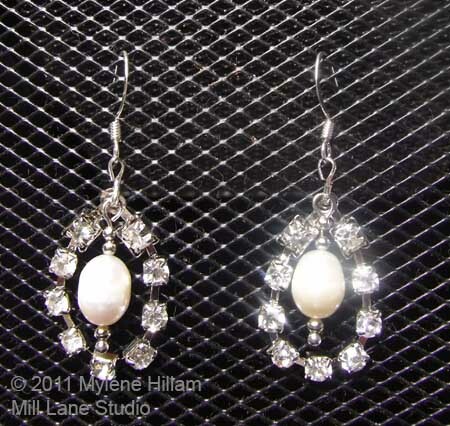 And for the woman who loves bling - Crystal and Pearl Drops - a combination that always seems to work! I like the last two pair shown. Ohhh, so beautiful! Cannot believe how many different pairs you made! You are incredible! My favorites are the Pearl Tendrils and Heart Drops... so so beautiful! So beautiful! 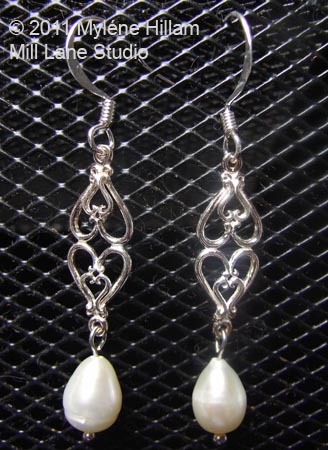 I love the pearl tendrils and heart drops! Thanks for the chance to win! These are stunning keep up the great work. They are all beautiful Mylene, but my first preference would be for the bling. Thanks for the chance.